Porkopolis, Cincy, Queen City — whatever you call it, Cincinnati is more than just the town that Jerry Springer used to preside over as mayor. (For example, it’s also the birthplace of famed director Steven Spielberg.) After being settled in the late 1700s, Cincinnati flourished so rapidly through the mid-1800s that it earned itself the name Queen City. Its population is now near 300,000, and is continuing to transform with a new riverfront, city skyline, and stadium. Although the main attractions are the Cincinnati Zoo and Botanical Garden, as well as the Cincinnati-adjacent Newport Aquarium, there is tons of character and history to be found around the city. You might, for instance, see more than a few flying pig decals and references. The story goes back to when Cincinnati enjoyed its 1800s heyday as Porkopolis — the largest producer of pork in the nation. As the locals tell it, when barges delivered the pigs to the slaughterhouse along the Ohio River, morning fog would make those pigs appear to fly. While you’re looking for the flying pig motif, also look around for another local staple: Cincy-style chili. Home to the University of Cincinnati, Xavier University, and a number of other schools, apartment competition can be tough. For college students, the apartment search tends to begin in November, peaking around May or June before the fall semester is underway. Still, apartments remain available year-round. The Over-the-Rhine neighborhood lies between downtown Cincy and the University of Cincinnati. Grabbing an apartment here will give you access to the best of both worlds, plus quite a view. The area is known for its gorgeous Italianate architecture and has more than 900 buildings on the National Historic Register. Cincinnati is surprisingly simple to navigate with public transportation, and it’s about to get even better. The METRO city bus system is pretty expansive, which makes finding an off-campus apartment as easy as it is convenient. That said, the buses have a lot of ground to cover, so depending on the route, the stops can be fairly far apart. As of September 2016, Cincinnati will also have a 3.6-mile streetcar route to connect the downtown, uptown and Over-the-Rhine neighborhoods. To explore more of Cincy’s surroundings, take a ride on the Southbank Shuttle, which takes you from downtown across the river to northern Kentucky neighborhoods Covington and Newport. Cincinnati has plenty to keep you busy. If you’re looking for concert venues, the biggest and best is Riverbend. For an active afternoon, check out the Web Extreme Entertainment for laser tag, go-karts, and everyone’s favorite mini games: golf and bowling. Or take the day off and lounge at the 2-acre Sunlite Pool at Coney Island, the largest flat-surfaced recirculating pool in the world. For more a picturesque pastime, take a walk along the recently redone riverfront. On top of the 75 acres, more than 580 species and rare exhibits of the Cincinnati Zoo, you can also hop on a ride, check out a 4D film, or stroll through the botanical gardens. Get a little more in touch with nature at the Newport Aquarium, just 2 miles from downtown Cincy, where you can walk across a rope bridge literally two inches above shark-infested waters. Or you can pet a sea star — that’s your call. But to really see Cincinnati, soak in the view from the 49th-floor observation deck of the historic Carew Tower, the second-tallest building in the city. Then again, you’ll also want to make time to cross the city’s many bridges, including the iconic Roebling Suspension Bridge, which was the longest in the world when it first opened in 1867. Take whatever mental picture you have of “chili” and throw it out the window before you get to Cincy. Here, it starts with a tomato base seasoned with cinnamon, cloves, cumin, chocolate — you know, the usual. Also mixed with ground beef and onions, the soupy mess is typically served up on a plate of spaghetti noodles, fries, a hot dog, or a burrito. One of the best places for the Cincy dish is Skyline Chili. If you’d rather eat almost anything else, you’re in luck. The authentically Italian Nicola’s Ristorante is one of the best restaurants in the city. Cincinnati also has your back for Mexican food, including Nada and Mazunte Taqueria Mexicana. For steak, the Precinct is certainly among the best, and Jeff Ruby’s Steakhouse has top seafood to boot. Also make sure to eat your way through the Findlay Market, Ohio’s oldest continuously running public market and one of its most beloved. Cincy has you all set for college bars. Right in the middle of the University of Cincinnati campus, Catskeller is your one-stop for live music, pool, and Bengals games — they have tons of flat-screen TVs and even more Cincy pride. Just east of downtown, the Mount Adams Pavilion is the perfect spot to sip a cocktail while soaking in a view of the Cincy skyline and Kentucky. Plus, later in the evenings, the Pavilion turns into one of the best places in the city to find DJs and dancing. To try out local brews, try Fifty West, Rhinegeist, MadTree Brewing Company, or even Taft’s Ale House. Moerlin Lager House also comes with a stellar view of the Roebling Suspension Bridge. 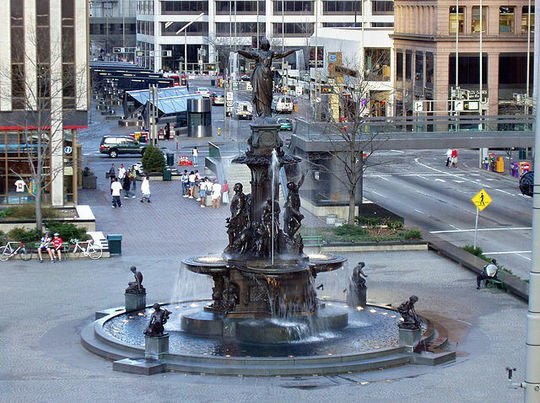 The Cincinnati Music Hall, the Aronoff Center, and Fountain Square are three of the largest venues in the city that host a wide range of landmark cultural events and concerts. Cincy is also home to the world-class Cincinnati Museum Center — a complex comprising the History Museum, Children’s Museum, and Museum of Natural History and Science — which occupies the former Union Terminal, originally a railroad station. The American Sign Museum offers a nostalgic stroll through the neon lights of a bygone era. You can find even more historic flair with Queen City Underground Tours, which take you through the city’s oldest districts and recently discovered tunnels. Or look up at the Cincinnati Observatory, the nation’s oldest still in use. For beer-lovers, there is Bockfest, which marks the release of s special spring brew, and Oktoberfest Zinzinnati, a beer-filled occasion to revel in German culture, food, and music that attracts more than half a million people each year. The largest R&B music festival in the world, Macy’s Music Festival, also takes place in Cincinnati each July. Have you heard of goetta? The super-popular Cincinnati breakfast food — made of ground meat and oats — has earned itself its own festival on the Ohio riverfront. Glier’s Goettafest (held by the world’s largest commercial producer of the food, 99% of which is consumed in Cincy) includes music, food, and lotsa goetta. If your festival appetite remains unstated, stop by the free Taste of Cincinnati each Memorial Day weekend, which offers rides, more than 100 dishes to try, live entertainment, and Food Truck Alley. There’s tons of shopping to be done in the Cincinnati area. Rookwood Shopping Center, on the west side of Cincinnati, is where to find a number of big name retailers. Closer to downtown, Tower Place Mall features typical upscale retailers like Tiffany & Co., Brooks Brothers, and Saks Fifth Avenue, in a modern complex. The largest variety, though, is found at the Kenwood Towne Center, on the northwest side. More than 180 stores means that it can take even the most dedicated shopper hours to make it through this mall. Need more? Check out the Liberty Center on the north side for a variety of restaurants, chain stores, and a theater. Just northeast of the city, Little Miami Scenic State Park is home to more than 70 miles of hiking and biking trails, plus more than 80 miles of waterway along the Little Miami River perfect for canoeing and fishing. There are more than 100 parks in the city, including Smale Riverfront Park, Bellevue Hill Park, and Twin Lakes at Eden Park — an expansive 165 acres that are home to some of Cincinnati’s best attractions, including the Cincinnati Art Museum and Playhouse in the Park. Mirror Lake, within Eden Park, also has an impressive 60-foot geyser.